First Lady Michelle Obama (right) presents the National Medal for Museum and Library Service to Delta Blues Museum in a White House ceremony Wednesday. Accepting the award (left to right) are community member Travis Calvin and Delta Blues Museum Executive Director Shelley Ritter. The National Medal is the nation’s highest honor conferred on museums and libraries for service to the community and celebrates institutions that make a difference for individuals, families, and communities. 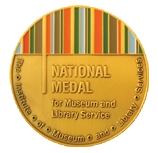 The 2013 National Medal for Museum and Library Service Ceremony was streamed live. Click here for the archived footage www.whitehouse.gov.